During the last US presidential election one of the Republican candidate decided not to campaign in the early stage! When pundits asked why, the answer they got from his campaign managers and aides was that he would join in the Florida campaign. The gentleman was playing a pick and choose campaign, giving up on some states and over confident with some other states like Florida. AEUP, after abstaining the first three discussions, for some "good reason" only known to it, has now decided to join the discussion! The Republican candidate never recovered from his mishap and never made it to the finish line of the pre-election campaign. Let us hope, for the sake of AEUP supporters, the fate of AEUP will not be the same as the gentleman from New York was! PM Meles On Food Aid Politics! Isaias Afeworki must think little about Eritreans! Otherwise he will not have ruled them with iron fist with no constitution and no rule of law. But did you know what he thinks about others? Mr Isaias you can not fool people always, once may be! Get this the border issue has nothing to do with Eritrea's misery today. Microsoft has launched Internet Explorer 8 in Ethiopia in a bid to protect internet cafes users' details from being stolen. The new product will address issues of security and safety on the net while surfing, according to the giant software company. The Coalition of Ethiopian Civil Society Organisations has become the first to be recognised by the National Electoral Board of Ethiopia (NEBE) to observe the national elections on Tuesday, March 9, 2010. We would also like to announce to all Queen Sheba Alumina Members and Supporters of the historic launching of Queen Sheba International Alumina at an Annual Meeting which is going to be a three-day event,scheduled for July 2nd, 3rd, & 4th, 2010 in Seattle, WA. 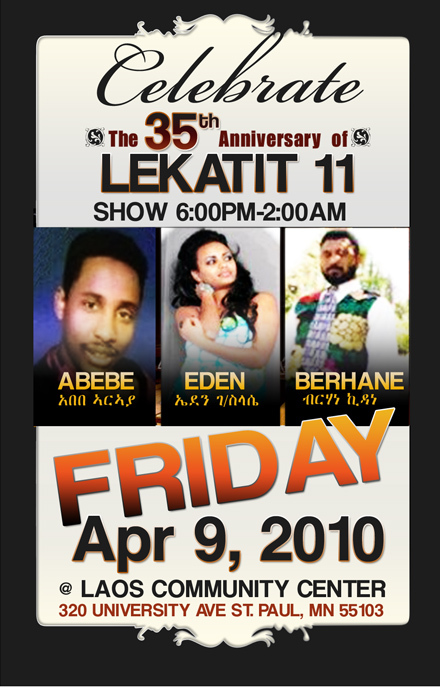 Lekatit 11 in Columbus Ohio !! !